Within the pages of this book, you'll explore the places and people of Rokugan, from small villages of fisherfolk or mighty daimyō in their castles to deep primordial forests and the spirits that dwell within. This book examines every aspect of life in the Emerald Empire, from food, to dress, to religion and spirituality, to matters of etiquette great and small. 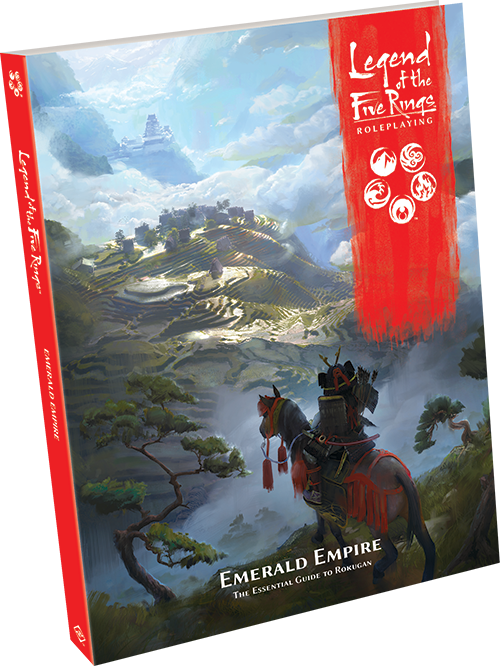 Emerald Empire is the first sourcebook for Legends of the Five Rings Roleplaying, and provides a look at the culture and landmarks of Rokugan as well as several new player options, including new advantages, disadvantages, and techniques. Each chapter of the book features a wide swathe of knowledge, examining not only an aspect of Rokugan, but how those aspects came to be. In addition, you'll find plenty to learn about specific landmarks throughout the realm, as well as various maps, rumors, adventure hooks, and stats for famed characters, giving Game Masters everything they need to craft a complete Emerald Empire. Just one of the pieces of Rokugani society encompassed within Emerald Empire are the monumental structures built by every clan. 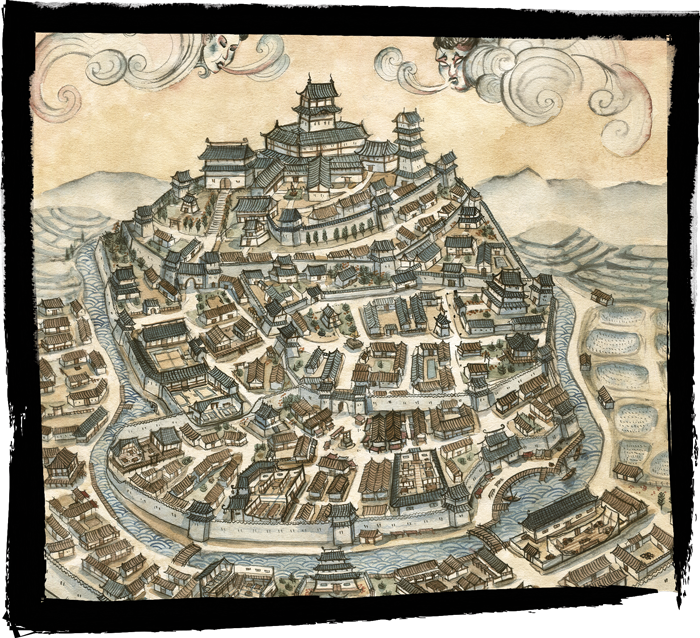 From the pragmatic edifices of the Crab to the elegant architecture of the Crane, castles and palaces populate Rokugan, constructed to protect and rule its lands. Although these structures are first and foremost military strongholds, they also serve as centers of government, administration, diplomacy, and civilization. While some samurai oversee small fiefs in the countryside, it is almost always considered a promotion to be invited to live in a castle town or, better yet, within the walls of the castle itself. The closer a samurai is to their lord, the greater their influence—and their perceived status. Castles are strongholds of war in Rokugan, and while this chapter in Emerald Empire explores several of these palaces in depth, it also examines how war functions in the land of Rokugan. From its bloody, dark history, to the soldiers that make up the armies of the Emerald Empire, this book will give Game Masters and players a full understanding of how to depict battles in the Legend of the Five Rings setting, down to the details of how specific clans wage war. The reflection of war is diplomacy, whose battlefield is the very strongholds depicted in this chapter. Emerald Empire also gives you a full rundown of courtly practices and perils. The broad strokes are covered, as well as minute details, like the particular practices of the clans. Emerald Empire is filled with maps of towns, castles, and more! The second part of this chapter is dedicated to just a few of the castles your party may come across in their journey. Perhaps your group of players find themselves at Toshi Ranbo, the stronghold long contested between the Lion and the Crane. Emerald Empire gives you everything you need to fully flesh out this castle, from long-held rumors to stats for NPCs to a complete history of the bloody battles that have made Toshi Ranbo a focal point of Rokugani politics. 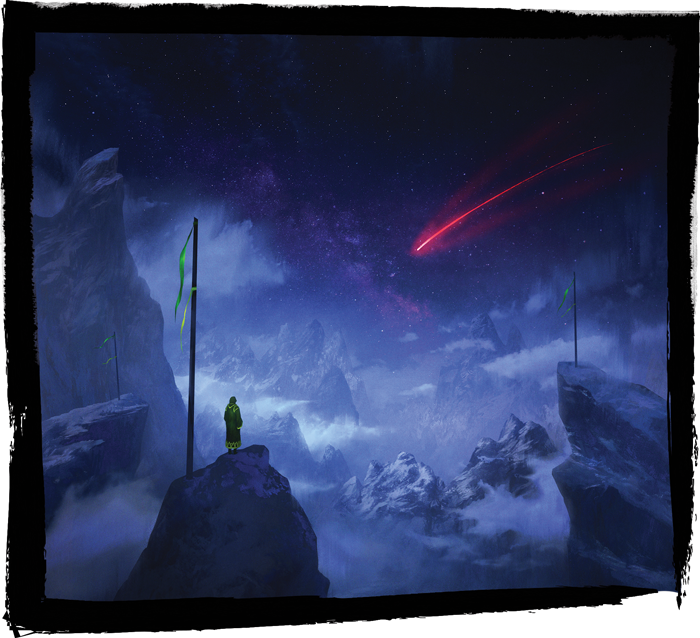 Every individual point of interest in Emerald Empire will have its own list of rumors, ripe for exploration! 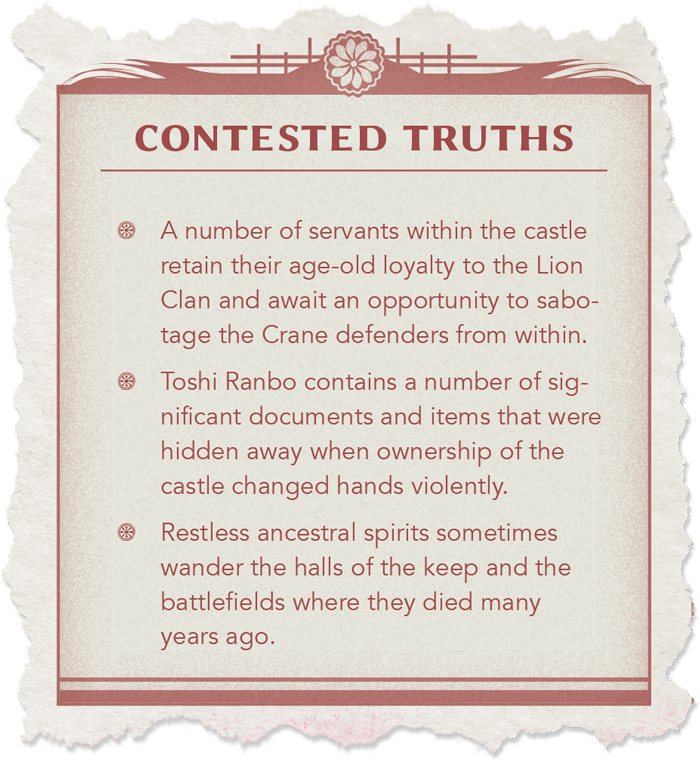 Perhaps your characters have come to Toshi Ranbo to explore the rumors of the forgotten spirits that haunt its halls, or maybe they have become wrapped up in the intrigue of defending against the next Lion attack. No matter what, Emerald Empire gives you all the seeds you need to grow an exceptional adventure. To its people, Rokugan is the pinnacle of civilization, for it was modeled after the Celestial Heavens themselves. Nevertheless, within the borders of the Emerald Empire there are vast stretches of wilderness. You don't need to venture far beyond the walls of a town or the farmlands around a village before finding yourself in true wilderness. The wilds of Rokugan—dense forests, isolated valleys, forbidding mountains, and even the sea—hold magnificent beauty and splendor, but also great danger. One must not only admire nature, but respect it. Samurai view themselves as paragons of the civilized world, yet they must often traverse the wilderness. A bushi might prepare an ambush in a mountain pass, a shugenja might commune with forest spirits, or a courtier might seek out a remote pond for poetic inspiration. 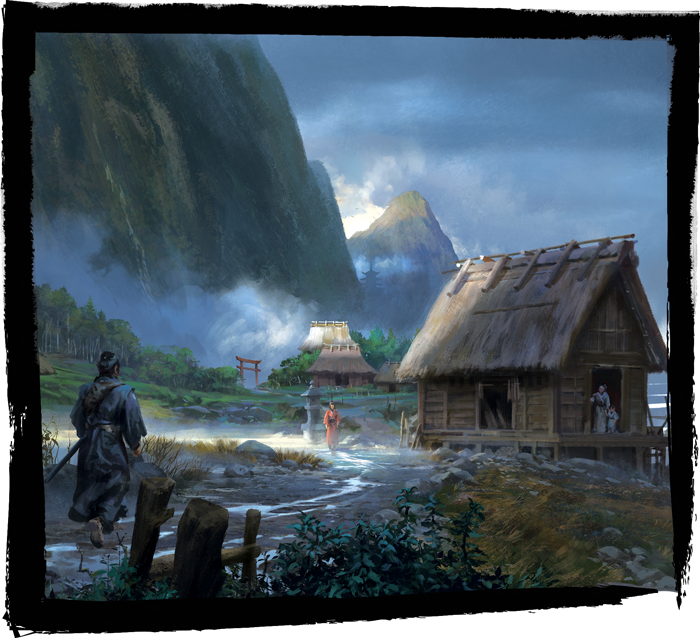 While the most of Rokugan consists of farmland and cities, you may find yourself in the outskirts, the uncharted, the wilds of the Emerald Empire. Towering mountains, crashing coastlines, and unending forests are all explored in Emerald Empire. If your party is so bold, you may find yourself at the base of the Dragon Mountains. Perhaps you are following up on the rumor of a Great Tengu named Sōjōbō living atop one of the tallest Dragon mountains, waiting to take on a student. Or maybe you have heard a tale of a tribe of Kitsu in the mountains, shape-shifting into humans to conduct trade. When you step into the wilderness of Rokugan, you invite adventure. There is a reason these lands are unsettled, and Emerald Empire gives you plenty of adventure hooks for your party. Strongholds and the wilderness are just two of the subjects covered in Emerald Empire. Look for additional sections covering centers of trade, farms and villages, sacred spaces, and the paths to enlightenment found throughout Rokugan. You can also expect to find new advantages, disadvantages, techniques, and more for your player characters. At over 250 pages, Emerald Empire is your guide to Rokugan, so prepare to enter a new world of honor and steel. 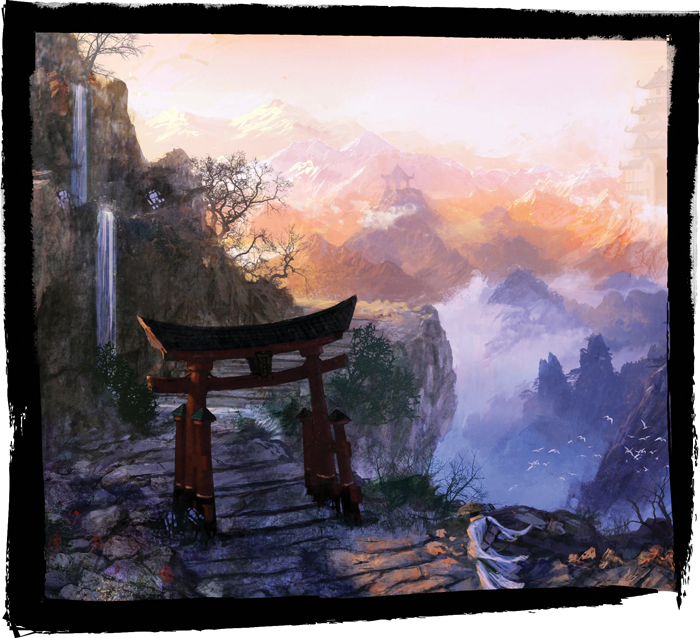 Find your guide with Emerald Empire (L5R04), a sourcebook for Legend of the Five Rings Roleplaying, available for pre-order from your local retailer or our website!